I have had many thoughts this week about problems within the modern academic study of Scripture. An inherent problem is that scholars of Scripture lack both imagination and experience. I do not mean to impugn the intelligence of any particular academic – indeed, I have known many interpreters of Scripture whose work was almost pure imagination. What I am alluding to is a limit of imagination to see the many layers, the form and shape of Scripture and the wonders of its construction. I can recall in both college and seminary courses having professors point to the fact that the Hebrew of Isaiah 7:14 reads (ambiguously) “a young woman shall conceive and bear a son,” rather than the Greek “a young virgin….” Early translators of the Old Testament from Hebrew to Greek chose the unambiguous term parthenos to render the Hebrew ‘alma. The conclusion thrust to our young minds was that an error in translation led to the doctrine of Christ’s virgin birth! Of course, this same simple conclusion ignored an entire tradition of Biblical interpretation that saw the Virgin Birth in far more than Isaiah 7:14, (not arguing the more obvious point that the doctrine of Christ’s Virgin Birth was actually based on His birth from a virgin). But the doctrine and the stories within Luke and Matthew have structures and layers and form that go far beyond the turn of a single Hebrew word. I could repeat this example many times. My thoughts about the limitations of Biblical scholarship this week have not been accidental. They have come as I have been taking part in a workshop on painting icons. 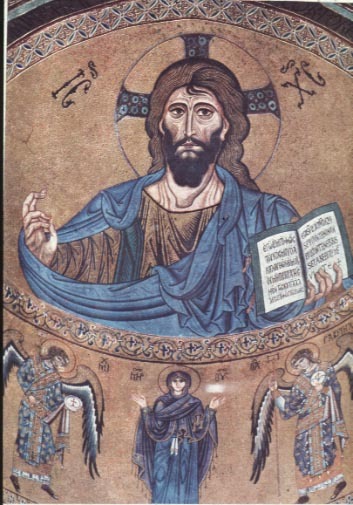 It has been my meditation on the Seventh Ecumenical Council’s proclamation: “Icons do with color what Scripture does with words,” that has led me to my conclusions about certain problems with Scriptural scholarship. For I believe that it is not only true that icons do with color what Scripture does with words, but also that Scripture does with words what icons do with color. Scripture, as used traditionally in the Christian faith, is iconic in its structure and form and will not be well understood apart from this. As I have taken part in the workshop this week, I have also had the benefit, and humbling experience of painting (or writing) an icon. And as all workshops should be – this one is conducted by a Master iconographer – someone who not only knows technique but also the theology and history of icons. It is a profound experience to be corrected by a Master iconographer (or to see the look of despair in her face as she would examine my work). But being in such a context I realized that no scholar of Scripture has ever sat with a writer of Scripture, or had someone stand over their work and critique them in quite the same manner. It is an inherent limitation of the academic study of Scripture. “O foolish men, and slow of heart to believe all that the prophets have spoken! Was it not necessary that the Christ should suffer these things and enter into his glory?” And beginning with Moses and all the prophets, he interpreted to them in all the scriptures the things concerning Himself (Luke 24:25-27). The reading of Scripture, “beginning with Moses and all the prophets,” is not an obvious matter. Those who argue for “soul competency” seem to ignore such examples as the story of the disciples on the road to Emmaus, or presume that somehow Pentecost fixed all that. But it is still the case that reading Scripture is something that must be taught (though the manner of its teaching will go far beyond the bounds of a scholastic classroom). What is taught must be more than “this is what this means.” What is taught must also be the form and shape and structure of Scripture. Scripture has a language that is far deeper and more constant than Greek or Hebrew – and it is a part of its language that must be learned. For instance, how does the New Testament read the Old Testament? It is here in such questions that the Christian understanding of Scripture as icon becomes apparent. We lack the experience of sitting with a master iconographer as we read Scripture, but the Tradition that is manifest in an iconographer, is also carried in the liturgical life of the Church. How do the prayers of the Church read Scripture? What form and shape do they see and what do they tell us about its structure? The liturgical life of the Church recognizes this iconic form in Scripture and even echoes it within its musical forms. That some feasts “sound” like other feasts is not an accident in Orthodox worship. All of this tells me something about the study of Scripture. Although modern scholarship in many places is completely ignorant of the liturgical legacy of the Orthodox faith – that liturgical life has not disappeared, nor has its reading of Scripture. To step into the active life of the creation of icons is to step into one of the deeper parts of the stream of Tradition. It is not a different stream than that of Scripture – one flows with color while the other flows with words – just as the liturgical life of the Church flows with music and action as well as words (and icons). All of them are one and the same stream of Tradition. It is good to stand deeply in any part of the waters (even if your work brings strange looks to the face of the master who guides you).